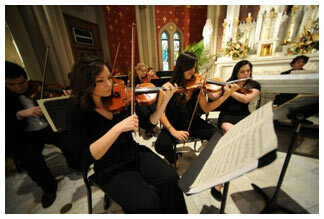 The Loyola Symphony Orchestra will continue the series of free concerts by faculty and student ensembles this month as part of the Montage Fine and Performing Arts Series at Loyola University New Orleans. All of the performances are open to the public. On Saturday, April 20 at 3 p.m. in Roussel Hall, the Loyola Concert Band and the Loyola Wind Ensemble, directed by Joseph Hebert, Ph.D., will perform a program featuring Percy Grainger’s “Irish Tune from County Derry,” Ralph Vaughan Williams’ “English Folk Song Suite” and Alfred Reed’s “A Springtime Celebration.” The Loyola University Chorus will join the musicians to perform “The Battle on Ice” from Sergei Prokofiev’s Alexander Nevsky Suite, as arranged by Hebert.